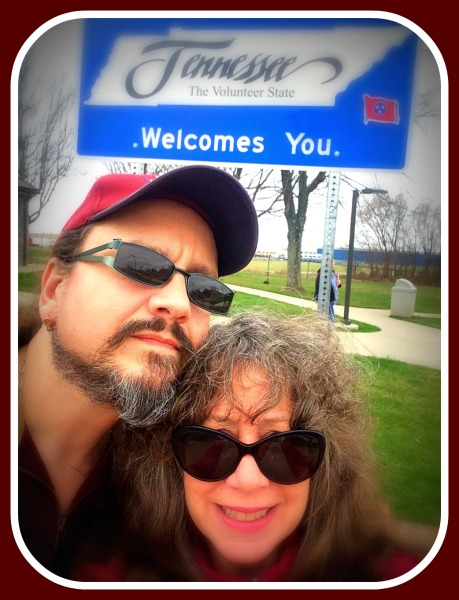 Down south, just a few hours away, we had our nose pointed towards Nashville. This excursion was more lively than usual as we are caravanning with cousins who have their own RV and are towing a good size pontoon boat behind them. We’d only been on the road for about an hour when I heard a familiar and most unwelcome sound – a low thumping growl from the rear of the coach that steadily increased in tempo. “We’ve got a bad tire,” says I. All but one that is. That’s right, the last Michelin tire left on the rig was about to blow. We radioed to our cousins to pull off the highway (that old pair of walkie-talkies have come in handy) and we limped into a Camping World service bay for repairs. It was a many hour delay, and the shop manager said we caught the tire just before a bad blow-out. Thump thump went my heart. 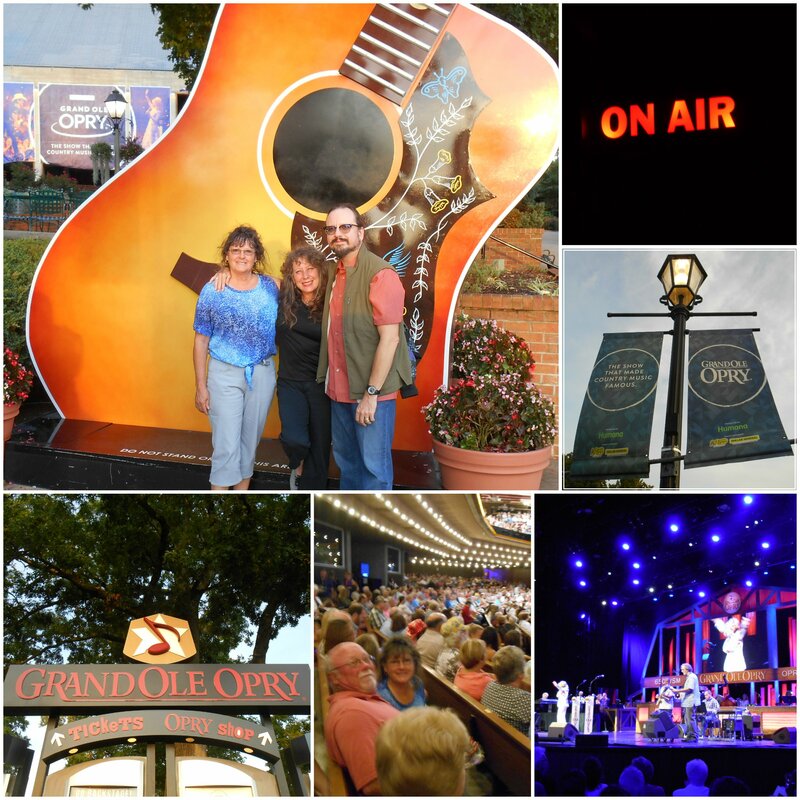 An hour later we smoothly rolled into Nashville on new rubber, arriving just in time to grab a quick dinner and head out for a show at the Grand Ole Opry. Whether you’re a country music fan or not, this is a first class venue with outstanding performers. It’s a variety show with about a dozen acts – a mix of well-known musicians, newcomers, and old-timers. The music was hot and lively, the audience was singing, and we had a grand ole time! Thump thump went the beat. Now that’s the kind of Nashville Thump I’d rather hear! We are staying overnight in Manchester, Tennessee – a town of substantial enough size to warrant two interstate exits and have five bars of cell phone service, but zero television stations via antenna. So we’ll be watching a DVD of all 23 episodes of Champion The Wonder Horse – a TV series from 1955, long lost (and with good reason) and available at your local flea market for $1. And the first ten minutes of the show will confirm that you’ve paid too much. We are camped at Old Stone Fort State Archeological Park. 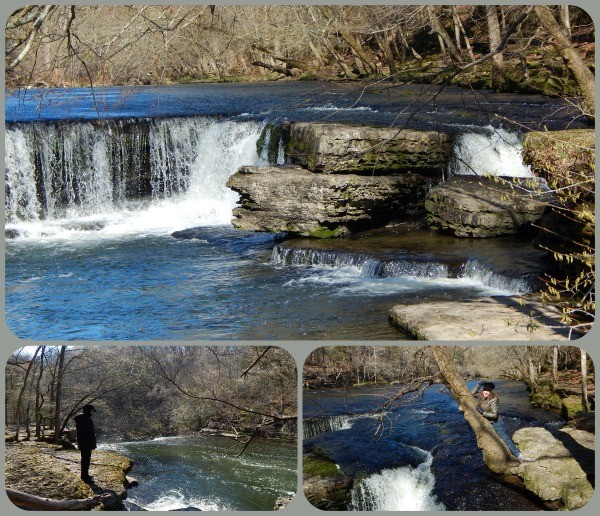 This park features a peninsula of about 50 acres located high on limestone cliffs and encircled by two rivers which form a natural moat. About 2000 years ago the Woodland Indians (so-called because their real name has been lost to the dust of history) built a stone wall fortification around the top of the peninsula. It’s a rare and unusual undertaking for people who had only clumsy stone axes to construct such a permanent and monumental structure. Eons later, after the Indians were long gone, white settlers saw the stone walls and assumed it was a fort – hence the name, Old Stone Fort. In fact archeologists haven’t a clue about the purpose of the wall, or why a primitive culture would expend such enormous effort to build it. There’s no evidence of a village here, no burial grounds or troves of artifacts have been unearthed, and of course no Indians left to explain the legend of the place. So, as often happens in the field of archeology, when the purpose of something is unclear they wring their hands and scratch their stubbly beards and label the thing a Ceremonial. And that is the explanation offered today at the park’s tiny museum – it was a ceremonial place. What sort of ceremonies might have taken place here, or why they needed to be protected by such an ambitiously planned fortification is left to the visitor’s imagination. The only clue ever discovered was a found by a farmer in 1876, who decided to have a poke around the rubble of the old walls and somehow unearthed a finely carved stone pipe. 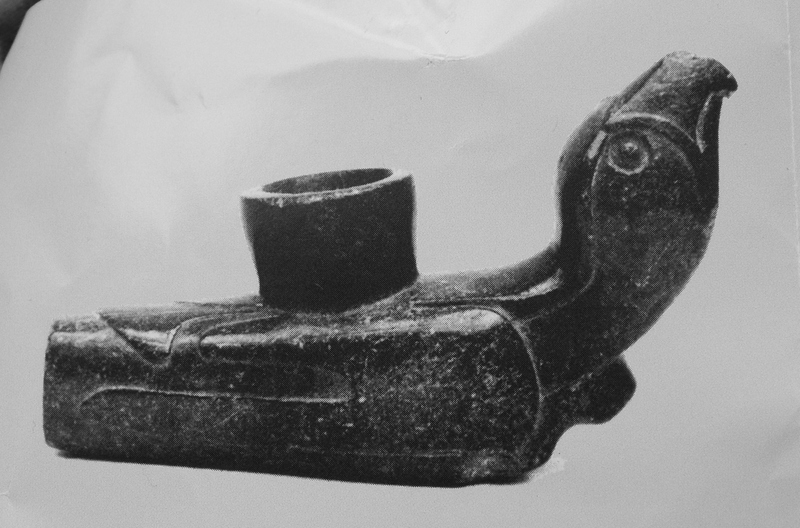 The Raptor Pipe became the iconic symbol of the area, and then was promptly whisked away to the Smithsonian. So it’s not even on display here. The ancient stone walls are also not visible, having been buried by the detritus of the surrounding woods for a couple of millennium. Instead all that can be seen are a line of vague mounds ringing the top of the cliffs. Disappointing, really, for a state archeological park. You’d think someone would have taken the time to excavate a few feet of the wall so you could at least see what all the fuss is about. But the park does have a lovely loop trail, easily walkable and running right next to a series of fetching waterfalls. For that alone, the trip here is worth it. Even if your evening entertainment turns out to be Champion The Wonder Horse. Sometimes a plan works out, and it’s immensely satisfying and even a bit surprising when things turn out well. Especially when you’re on the road. We travelled a couple of hundred miles south to Chattanooga today. An easy interstate lope, with only one traffic snarl that was mostly a mild inconvenience. We pulled into Raccoon Mountain, sans reservations, and scored a good, level, pull-thru spot. I had aimed for this RV park because it had promised some unusual amenities. 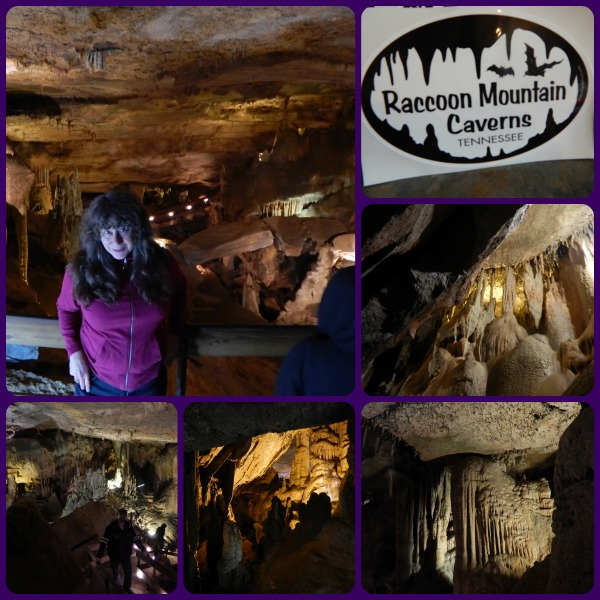 So after a short rest and a quick snack, we rambled out of the camper and up a little staircase to tour Raccoon Caverns – an almost famous cave system just a few steps from our parking spot. 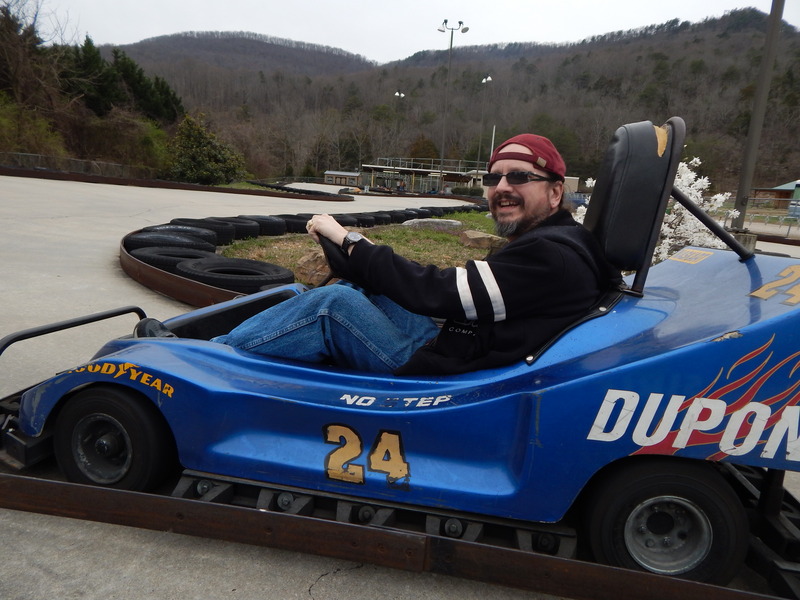 Today a special was offered along with the cave tour tickets – two rounds of Go Kart time. 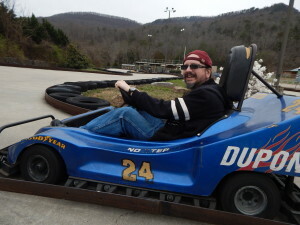 Lucky us, we had the track to ourselves. I never know whether to trust the campground write-ups because sometimes they over-promise. But this place lived up to expectations and we enjoyed an afternoon of fun, just steps from our campsite. Worked out just like a plan! After much hoo-haw and futzing around with unexpected repairs all week we finally managed to get on the road today and travel to another state – and hopefully a better state of mind! A couple of weeks ago we gingered the RV out of its winter cocoon to haul it in for annual service ($$$). Usually this brings us up to cruising speed, all the little nagging repairs tidily fixed to make it road worthy. When we got the coach back home I started prepping it for our trip – the usual preflight check list, including flushing the interior water lines and tanks. That’s when a busted water pump was discovered ($$). Yeah, okay – that was a DIY repair. Only took one extra trip to the dealer to hunt for parts, fiddling with fussy teflon tape, and losing a couple of screws down an invisible crevice. But we got the pump working. The next day I filled the water tank and ran the new pump. All 25 gallons immediately drained down the side of the coach like a kiddy pool with a punch hole. Ah. Not good. Made another appointment at the dealer. It was about then, standing in the driveway lamenting our luck, that we noticed one of the rear dualie tires was flat. Oh, and the opposite side tire had a quarter-size chink in the sidewall. So next came an unplanned trip to the tire store ($$$). Riding on the new tires we drove wearily back to the dealer to see about the water leak. Got the bad news that afternoon…the hot water tank had frozen and busted wide open. We were told sternly and without a hint of kindness that it was Our Fault for not draining the tank via an inaccessible and undocumented rear petcock. A new hot water tank was ordered ($$$$) to be paid in advance, naturally. However it’s a specialty model and not available for 2-3 weeks, so we have to travel with only the cold water lines working. Sigh. Fine, I’ll just heat up a pan of water in the microwave to wash my hair somehow. We left the new kittens in the good care of friends, stuffed the parakeet in his travel cage and had a mercifully uneventful ride down to Nashville. 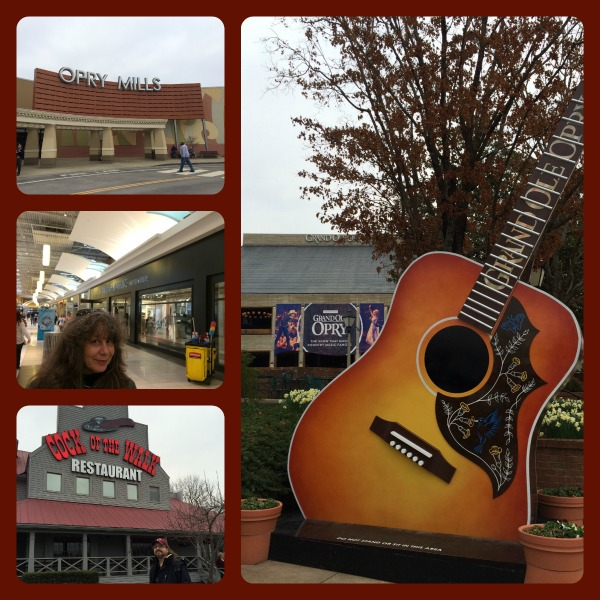 I’d chosen a campground near Opry Mills Mall where Tim could visit the renowned Gibson Guitar Factory. We hopped on the motorcycle, drove over, and walked most of the mall only to discover that the Gibson factory had relocated several years ago after the Cumberland River jumped its banks and flooded the entire area, ruining the mall and Gibson’s precious stockpile of exotic woods scheduled to become pricey guitars. Disappointed, we sauntered out of the mall intending to ride around the area in search of a nice meal. You can guess what happened next. Yup, the bike wouldn’t start. Dead battery right there in the parking lot. Gratefully this bike is pretty low-tech, so with a good push we could jump start it. But we’ll need to find a motorcycle shop tomorrow and buy a new battery ($$). Whew – our vacation has just started and already we’re broke and exhausted! 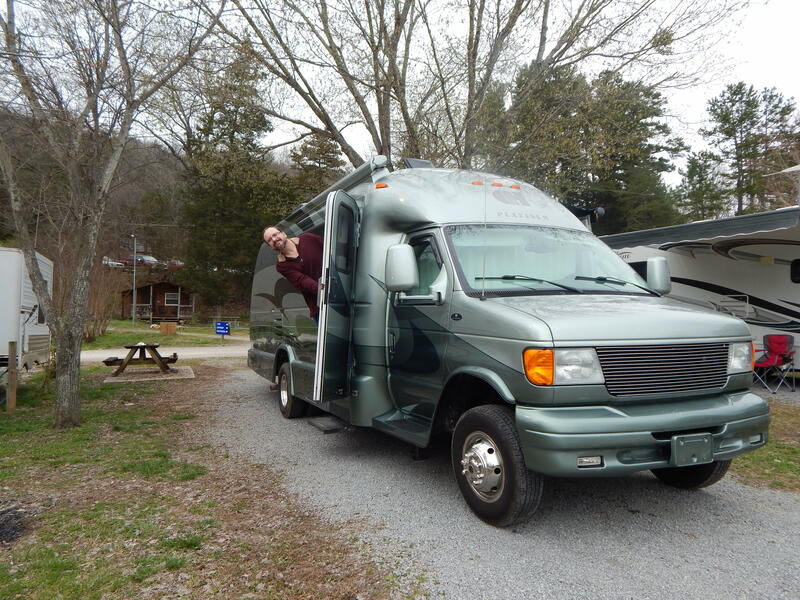 Having a motorhome means…get this…you’re motoring a lot. On the road and traveling the wilds of America’s interstate system, where anything can happen. Like another Epic Traffic Jam. Alert Readers will recall that less than a week ago we spent the better part of a day parked on I-71 while highly trained authorities and expert contractors spread a truckload of molten fat across the highway and had a giant weenie roast as the gooey stuff burned for more than 11 hours. They had a really great time, said they would do it again real soon, and the Kentucky State Police even invited travelers to join in the fun by keeping the highway open. We went along because, geez, how often do you get to see 44,000 lbs. of Crisco go up in flames, and besides there weren’t any warnings that we’d be stuck in a colossal tailgate party for the rest of the day. Out here in Tennessee, authorities don’t have the same partying spirit. They actually closed the highway and diverted traffic from the scene of a huge wreck. From the midst of the Smokey Mountains we saw a black plume rising, and it didn’t seem like the kind of picturesque vapor that would usually draw tourists. Sure enough, there were yellow flashing signs, red traffic cones, and serious-looking cops waving us off the interstate. It was supper time, we hadn’t had a snack in a good 20 minutes, so we pulled into a campground on the detour road and tucked in for the night. And we watched an account of the accident scene on the national news. If it had been Kentucky, we could have seen it live. Day broke with a steady drizzle and everyone opted to sleep in a bit, including the dog who was just too comfy to bother with a morning walk. Did I mention we’re traveling with a bird as well? Billy Boy is a very young parakeet that we’re trying to hand-tame. Good progress has been made, so we were reluctant to leave him at home. Around 10:00 we decided the rain wasn’t going to quit, so taking umbrellas in hand, we walked up to the shopping area. We returned to the Coleman outlet to buy a couple of life vests for the inflatable boat we bought yesterday. Spent $50 in vests for a boat that cost only $25! The rest of the day was devoted to Tim’s pilgrimage to Smoky Mountain Knife Works (SMKW). This enormous store is a tourist stop in its own right, and in fact we saw a couple of buses disgorging eager shoppers. SMKW is like a giant Cabella’s or Bass Pro Shop, except it’s devoted primarily to all things sharp and bladed. Tim had a grand time poking through three floors of merchandise: Kitchen World, Knife Making Supplies, Knife Artifact Corner, Swiss Army Knife display, plus the Zombie and Stars Wars sections. The entire third floor is the National Knife Museum which includes thousands of examples arranged to tell the history of knife making from stone tools up to factory-made blades. Tim spent all day in the store. Like 5 ½ -6 hours. I was game for a couple of hours, and then I left to find other entertainment. About the time I thought I’d have to bring him a pillow because it looked like he was going to sleep there, he came shambling down to the campground clutching an armful of goodies. Even though our trip has just started, I can tell already this day was the highlight for him! Our 2013 camping season has begun with a nice long trip south, hoping to catch some warm weather. First stop is the Great Smoky Mountains. 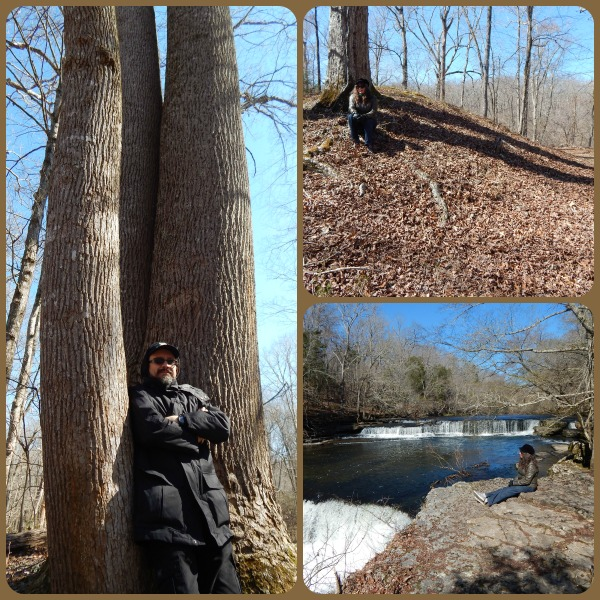 Spring is trying hard to commence, and blossoms are just beginning to show on the trees here in Tennessee. 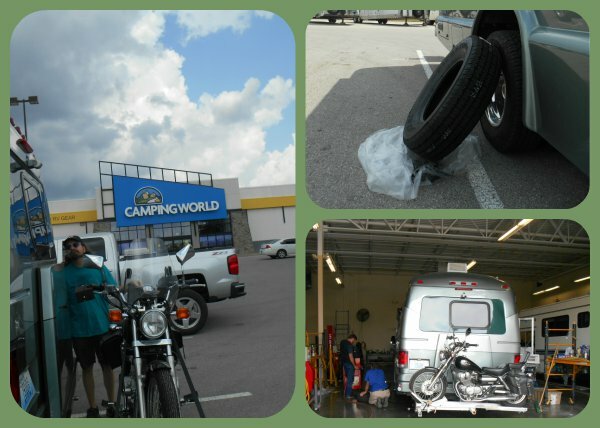 Outside of Knoxville we made an obligatory stop at Camping World, a giant store that caters to the peculiar needs of RV’ers. We spotted a darling pop-up trailer set up in the lobby – tiniest rig I’ve ever seen! A bit further on we dropped off the interstate onto the clogged artery of Route 66, the only road which leads into Pigeon Forge and Gatlinburg. This is a two lane highway that sees as much traffic as the New Jersey Turnpike, and they are struggling to expand it to a four-laner. We are camped at the splendid Two Rivers Landing, located at the confluence of the French Broad and Little Pigeon Rivers. This campground is quite new, and offers deliciously level concrete parking sites, hemmed by low hedges. Within walking distance is the fabled Smoky Mountain Knife Works, a Coleman outlet, Lodge Cast Iron store, and a host of other interesting looking shops. We arrived early enough today to do a quick pass around the area, lucking upon a tent sale at Coleman where Tim bought a small inflatable boat for those lake-side trips to come later in the summer. We will loll here in Sevierville until Monday, so tomorrow will be dedicated to some serious shopping. I’ve saved a wee bit of room in the motorhome for some good finds!